A student learns how to navigate multiple obstacles on the steps at Malibu Creek State Park during the July free Basic Skills Clinic. The next skills clinic is Saturday August 7th. Dowhnill rider yields to uphill rider: The thinking is that it is harder for the uphill rider to get going again from a stopped position, therefore the downhill rider should stop for the uphill rider. 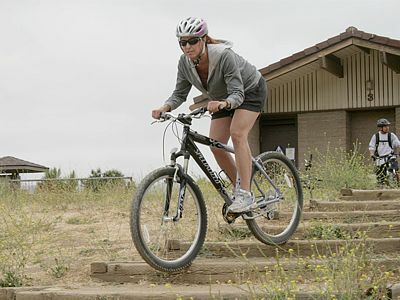 Uphill rider yields to downhill rider: Often the uphill rider sees/hears the downhill rider before the downhill rider sees the one going up, so it might be prudent for the uphill rider to stop and get out of the way early in case the downhill rider doesn’t have enough time to avoid the uphill rider if they are both riding when they meet. In either case, it really comes down to paying attention and deciding what the best course of action is for both riders. Speaking of passing on a singletrack, there are a couple of other things to consider. Sometimes it is possible for both riders meeting in opposite directions to pass each other while riding. However, I’ve had the experience several times when one or both of the riders look at each other, rather than at the trail, and we wind up almost colliding. Here’s a tip: Look at your line, not the rider. Just like with trail riding in general, look where you want to go, not where you don’t want to go. If you are traveling downhill and you hear someone coming up from behind, you can either stop and let the rider pass, or slow down until such a time as they let you know they are coming by. But in either case, do not turn your head to look behind you. This can pull your hands in the direction you turn your head and cause you to ride off the trail. Mark Langton is the coordinator and lead instructor for CORBA’s free monthly Introduction to Mountain Bike Skills class. Recently CORBA received news of two significant financial contributions to CORBA’s trail work and advocacy efforts by Recreational Equipment, Inc. (REI). 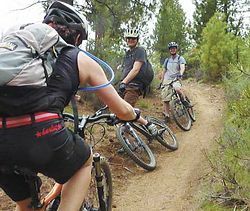 First, we were notified by REI that our application for REI’s Trail Upkeep grant was accepted. The $5,000 grant will help CORBA purchase and maintain tools and equipment for upcoming trail work projects, including projects in the Angeles National Forest’s Station Fire area. REI also confirmed that they will be supporting CORBA’s Fat Tire Fest with a Platinum Level sponsorship ($3,500). REI is the Fat Tire Fest’s first ever Platinum Level sponsor. 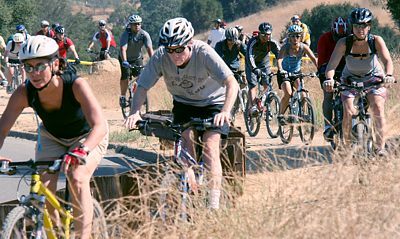 The Fat Tire Fest takes place October 17 at Castaic Lake. CORBA thanks REI for their support and confidence in us! 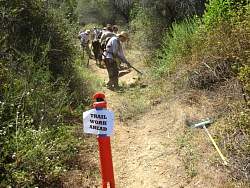 Thanks to all who came out on Saturday 7/17/10 to help out with some brush clearing on Rogers Road in Will Rogers State Historic Park/Topanga State Park. It was a hot day and that made it tough. We had 13 volunteers show up. We hiked in just over 2 miles to the lone Oak and worked back from there. We managed to clear 1/2 mile of the trail. There are a few more miles that are getting very overgrown so we will be scheduling a few more work session in the next few months. View the photo gallery of Saturday’s trailwork. Hundreds of hikers and bicyclists have been spotted in areas closed for construction. Some are genuinely unaware of the roadblocks along the popular trails, while others trespass out of defiance. About 20 miles of the 66-mile Angeles Crest Highway, from La Cañada Flintridge to Mt. Wilson Road and 25% of the Angeles National Forest remain off-limits to the public as construction crews rebuild pieces of the route that winter storms caused to wash out. The $16.5 million in repairs, contracted out to Thousand Oaks-based Burns Pacific Construction, is expected to be completed in November. Meanwhile, the closures continue to frustrate and confuse those seeking to access some of the most popular portions of the San Gabriel Mountains. See our blog for the rest of this story. Roughly $700,000 has been earmarked for improving the forest roads and trails that were destroyed last year during the Station fire, officials said. “The roads and trails have been eroded and degraded,” said Richard Toyon, former forest ranger and president of the local nonprofit Volunteers Organizing in Conserving the Environment. Trekking on some trails in the forest is challenging because they eventually disappear, he said, and some roads and trails are no longer recognizable. If the bill is approved, the funding would be allocated to the U.S. Forest Service to handle the restoration work. See our blog for the rest of this story. Los Angeles County trail access meeting July 20 – mark your calendar! Saturday August 7th is the next skills clinic.